You’re probably wondering why anyone would try and improve “Lady in the Water” and “The Happening”. 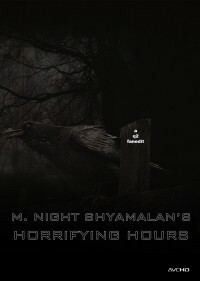 Simply, I have a deep respect for M. Night Shyamalan. His film “Unbreakable” I consider one of the best films of the decade, and he proved his prowess with it. So how did he go from a brilliant movie like that to stinkers like “Lady in the Water” and “The Happening”? After re-watching the films I knew what it was. The extra padding he included was poorly done, with excessive dialog and, in the case of “The Happening”, an uninteresting subplot. My goal was to cut each film down to 60 minutes and release them as a double feature. While I managed to do that with “The Happening” I couldn’t quite achieve that running time with “Lady in the Water”. I really wanted to cut out the Asian woman’s fable, but Shyamalan used this as a crutch to explain what was happening in the movie. Because of this exposition I couldn’t completely remove it for fear of confusing the audience. But with approximately 30 minutes cut the movie does flow a lot better. Well these movies can't be fixed but that wasn't the point. If you like Shyamalan’s films you'll get a kick out of this. The b&w looked great and the editing was top notch. I lost all my expectations for Shamalamadingdong the moment the credits rolled after Unbreakable. To follow up something as enjoyable as Sixth Sense with something as plodding and boring as that did not bode well for his career, and M’s career has been consistently erratic ever since. By the time The Happening and Lady came out I had just plain given up all together and I simply didn’t even bother to watch these. But intrigued by Q2′s creative idea I trudged out and picked up copies of these maligned flicks, and proceeded to see what Q2 had achieved. Overall, I have to say I was pleasantly surprised by both movies of this double-feature. 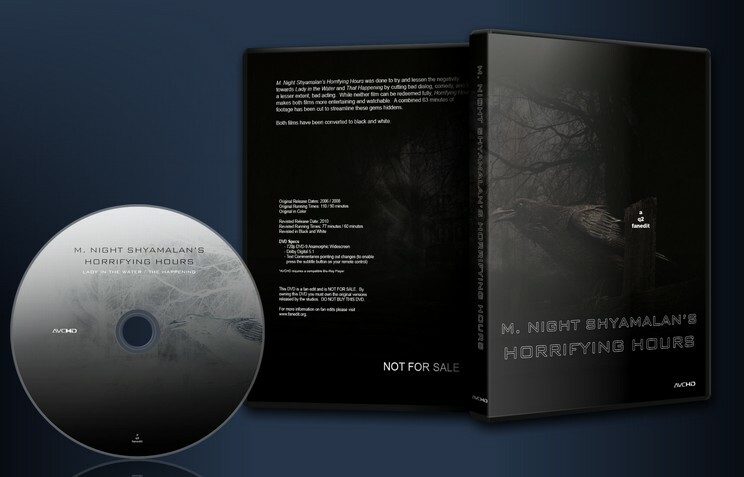 For this review I watched the Single Layer DVD5 and the video quality was good on both TV’s that I watched this on (32″ LCD and 52″ Plasma) Audio was good for both, although my rears are currently not working so cannot fully evaluate the 5.1. Contrary to those who reviewed this before me, I found I quite enjoyed Q2′s take on Lady. The black and white worked even more for me on this as it helped place them in a sort of undetermined twilight that helped make them feel more isolated and in a fairy tale. I wasn’t bothered by how the participants in the plan quickly bought into the story. For me, it was simply a matter of them all sensing that something bigger than themselves was going on. It was obvious that Q2 had cut out a ton of really boring exposition and useless dialog which Shama seems to bloat his screenplays with, and this kept the movie focused and moving forward. My only major critique was the manner in which he handled Giamatti going into the pool to recover her ‘key’. Not seeing him even enter or exit the water really threw me for a loop at first and it took me out of the movie while I had to figure out what had happened. While I did figure out what happened, the lack of visual assistance severely interrupted the flow of the movie and it took me a few minutes to find myself back into the movie. If I had to watch either of these movies again, these are the only versions I would consider watching. Technically well executed, these are both improvements on the original. I’m feeling like the other reviewers although I probably liked Lady in the Water a bit more. Problem is indeed how everyone react so irrational. I mean, it’s a kind of “fairy tale” but I need to feel what the characters feel to care for them. It worked at some level for the Giamatti’s character, but everyone else looked like part of a puzzle story just waiting for the right moment to play their part and this is the only problem I had, but it’s a big one. Other than that the editing work is perfect in both movies. Pictures quality is VERY good, menu are great. The Happening is SO much better now it’s incredible. I mean, it’s the same story, same characters, but I could feel the tension that was not present for me in the original. GREAT job at making good something bad. I can understand why other reviewers gave it a 7/10, but I was so pleasantly surprised by this DVD that I can’t rate it less than 8/10. My rating of 7/10 is for the Happening part of this edit. While I still didn’t think the movie was very good, it was much improved over the original, there’s just not much of any good material to work with. So, my score is mostly for the effort and improvement, than for my enjoyment of the end result. I did think the black and white worked really well in some scenes, but felt a bit flat in others.